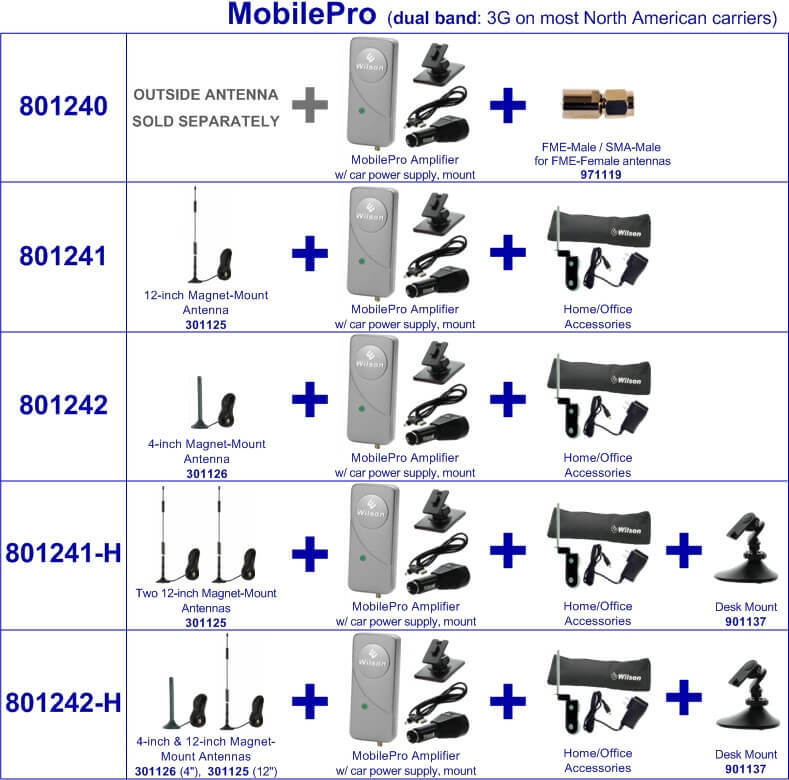 The MobilePro is a popular cellular signal boosting solution due to the combination of portability and versatility. This small wireless amplifier has a built-in interior antenna only requiring an exterior antenna. It provides a gain of up to 45dB making it one of the more powerful amplifiers on the market and is able to work for all North American 3G/2G networks (except those which utilize iDEN or WiMax). It is available by itself (801240) or in four pre-built kits (801241, 801242, 801241-H, 801242-H) capable of working in a vehicle or building setting. The 801240 amplifier only includes the MobilePro amplifier unit, Mini-USB to USB charging cable, DC car charger, dashboard vehicle mount, and a SMA-Male/FME-Male connector (971119). This kit requires the purchase of an exterior antenna giving the consumer the choice of any vehicle or trucker exterior antenna. The amplifier utilizes an SMA port for an exterior antenna but includes a connector to FME which encompasses the majority of exterior antennas available. The 801241 pre-built kit includes the MobilePro amplifier unit, Mini-USB to USB charging cable, DC car charger, dashboard vehicle mount, Home Accessory Kit, and 12in magnet mount antenna (301125). The Home Accessory Kit includes an AC power adapter (859969), suction cup window exterior antenna bracket (901128) with a long radial to prevent potential interference between inside and outside antennas, and 13in carrying case (859946). There is a kit (859952) which includes the window bracket and AC power adapter as a replacement part or for a different location. The outside antenna includes a 10ft RG174 cable with an SMA-Male connector. It uses a very powerful rare-earth magnet to securely install to the top of a vehicle or onto the included window bracket mount when used indoors. The 801242 pre-built kit is similar to the 801241 only it includes a 4in magnet mount exterior antenna (301126) instead of the 12in magnet mount antenna. The 801241-H and 801242-H pre-built bundles include the 801241 and 801242 respectively along with an additional 12in magnet mount antenna (301125) and desktop mount (901137). 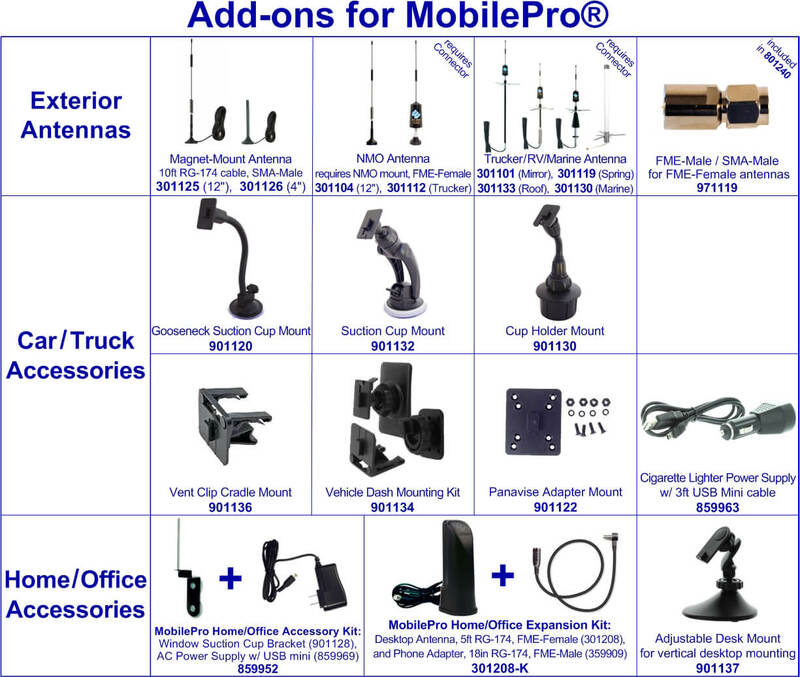 These kits truly take advantage of the MobilePro portability. It allows for a user to easily leave one antenna in an indoor setting and the other antenna in a vehicle setting allowing for a user to easily move only the small amplifier unit between settings. 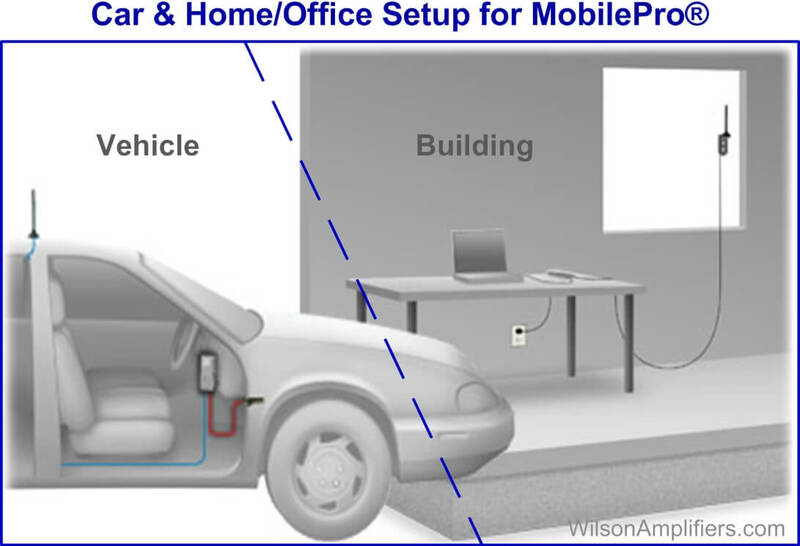 The MobilePro’s popularity is derived from its quick and easy mobility.